The doctrines of grace are not a sixteenth-century invention. They are God’s doctrines, revealed in His Word, rooted in eternity past, and accomplished in history. 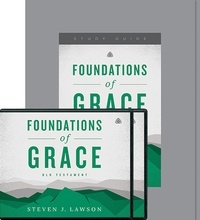 In the two-part series Foundations of Grace, Dr. Steven J. Lawson surveys the entire Bible to demonstrate that salvation is the work of the Father, Son, and Holy Spirit from beginning to end. You can also order the individual Old Testament or New Testament volumes.